A four-day Youth Forum on using Earth Observation for Climate Change Actions kicked off in Islamabad today. The youth forum is being organized by the International Centre for Integrated Mountain Development (ICIMOD), in collaboration with the Pakistan Agricultural Research Council (PARC), under the SERVIR-Himalaya Initiative supported by the National Aeronautics and Space Administration (NASA) and the United States Agency for International Development (USAID). The main aim of the youth forum is to raise awareness and empower youth in Pakistan on the use of earth observation information and allied technologies for climate actions. This Youth Forum will also emphasize the importance of communicating the message about climate change, raising awareness about the issues and promoting solutions. 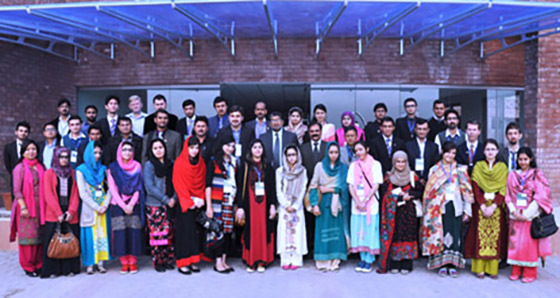 Participants at SERVIR-Himalaya Youth Forum Using Earth Observation for Climate Change Actions in Pakistan. The forum, which is being held from 24 to 27 November 2014, has brought together 40 students from mountain areas like Chitral, Hunza, Swat, Bannu as well as from some major cities of Pakistan. The participants will attend lectures on the environmental impacts of climate change and learn about the latest geospatial technologies, tools and services. It is expected that the participants, who come from diverse backgrounds, will learn from each other’s experiences, form networks and initiate collaborations. In his inaugural remarks, Dr Iftikhar Ahmad, Chairman of Pakistan Agriculture Research Council (PARC), stated that as a country with 50% of population under the age of 25, Pakistan has immense potential to promote new technologies in agriculture and related sectors. He also shared his experience interacting with youth from remote mountain areas who share the aspirations of urban youth to contribute in nation building. He said that the Youth Forum would inspire young people, particularly from remote mountain areas of Pakistan, to use geospatial science, earth observation and related technologies to address climate change and related issues. In his welcome note, Dr Muhammad Azeem Ahmed Khan, Director General of the National Agricultural Research Centre (NARC), stated that with increased intensity and frequency of extreme climatic changes like drought and floods, farmers are already adopting ways to adapt to these changes. This needs to be understood and integrated into policies and decision making. He said that topics like assessment of the status of glaciers, permafrost, water availability, land productivity and emergency relief are becoming increasingly relevant, and it is important to develop knowledge of these issues. He suggested that the earth observation system and geo-information technologies are very useful and should be used as basic tools for exploring these interlinked disciplines. Dr Khan also elaborated on the collaboration between PARC and ICIMOD in conducting research and training activities in Pakistan. In his keynote speech, Mr Birendra Bajracharya, Regional Programme Manager for MENRIS Programme at ICIMOD, thanked PARC for its cooperation in organizing the event. Giving the examples of Earth Observation resources and their applications, he said that this forum provides a unique opportunity for youth from across the country to engage with each other in addressing the challenges of sustainability by applying location-specific solutions. Ms Gul Sanam, one of the participants, said that she expects to learn about the use of satellite remote sensing to analyse the nature of changes like glacial melt, deforestation, floods, etc. in the region and use these skills to protect communities from natural disasters. The four-day event will encourage and enable the youth in Pakistan to actively engage in preparedness, risk reduction, adaptation, and mitigation to address climate change issues..